The state of Japanese restaurants in Vancouver can be pretty much summed up by one word: unauthentic. Okay, I may be going back on my word a bit when I say that because I truly believe it really doesn't matter who makes the food as long as it is tasty. However, with Japanese cuisine, the sushi chef really must know what they are doing. Hence, it is usually better that the sushi chef is Japanese. That isn't the end all though. There are bad Japanese sushi chefs as well. I'm just saying that it would potentially help the cause if they were. And that's where the unauthentic term starts to creep in. 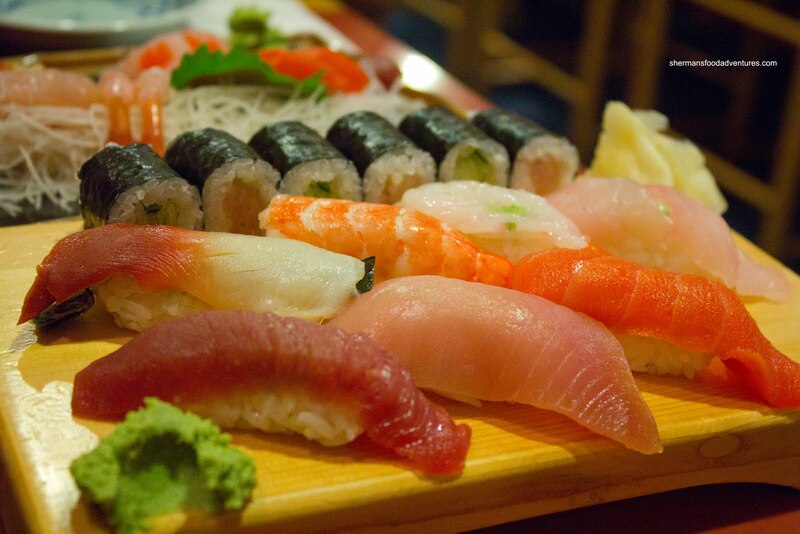 There are very few Japanese-run sushi joints in Vancouver despite the plethora of Japanese restaurants. I've been to quite a few of the Japanese-run establishments and they have been pretty good so far. 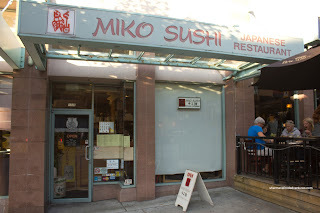 Up next was Miko Japanese on Robson. Meeting up with Mr. X, we decided to tackle the menu by going for the raw stuff first. 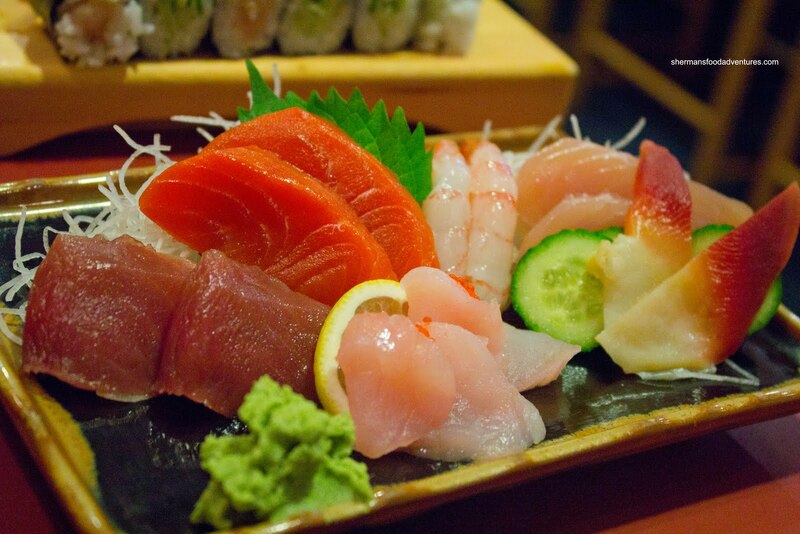 We started with the Assorted Sashimi consisting of red tuna, salmon, amaebi, albacore tuna, hokkagai and red snapper. 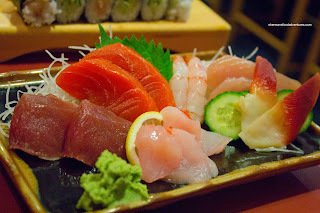 As evidenced in the picture, the sashimi had a nice fresh sheen which was confirmed with every bite. Texturally, everything was bang on and we could taste the natural sweetness of each item. As if the sushi chef's knife skills weren't apparent in the assorted sashimi, it was on display with the Assorted Sushi. Neatly presented and aesthetically pleasing, the fish was of course, just as good as the sashimi. We found the rice to be nicely prepared with some bite while not being too firm either. Furthermore, I thought the rice had just the right amount of vinegar which did not overwhelm. 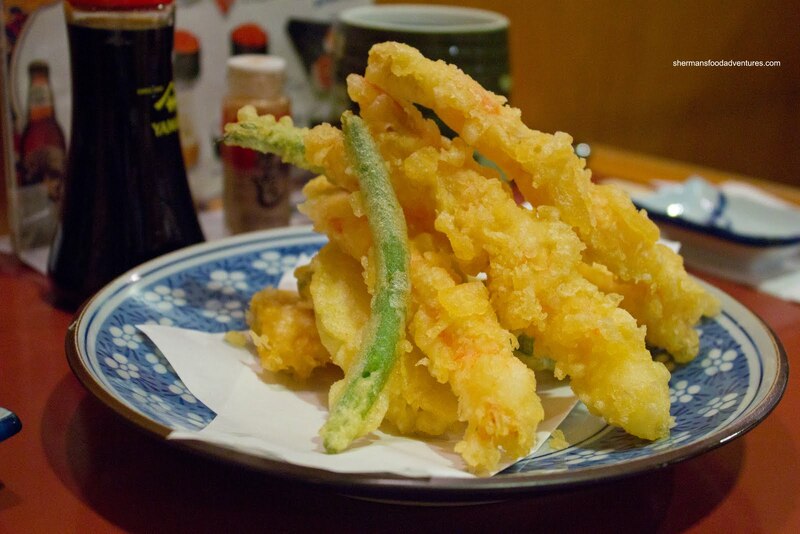 Onto some cooked items, we tried the Assorted Tempura which was delicately prepared. I say "delicately" because far too many places just slap on an obscene amount of batter and call something tempura. 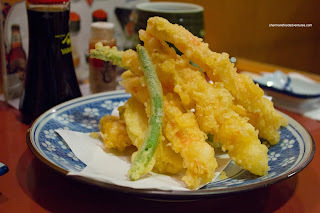 Well, there was the right amount of crispy batter on both the veggies and ebi. Although it appears in the picture that there is quite a lot of batter on the ebi, it was still light and not oily. 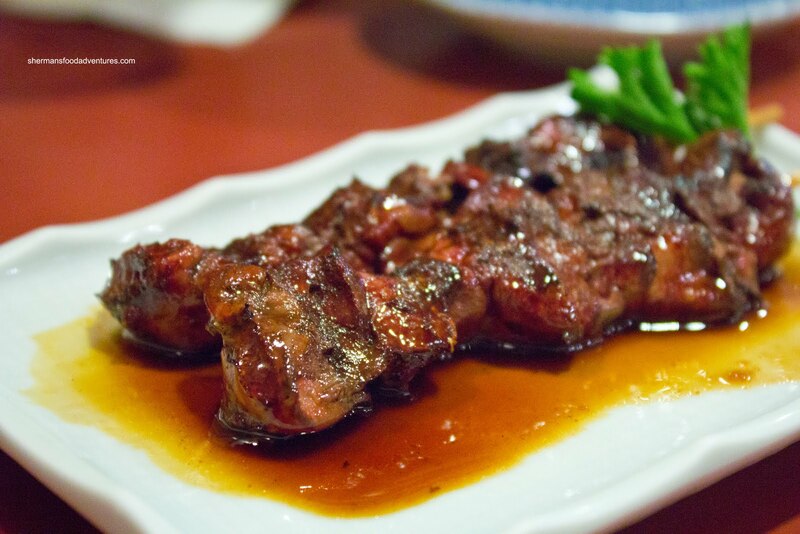 If you can believe it or not, I could also use "delicate" to describe the Robata Chicken Livers. Although livers can be heavy, these were too bad. I suppose the moderate seasoning applied helped "lighten" the dish. Moreover, the livers were not grossly overcooked so there was still some bounce to them. Despite saying that these livers were "delicate", there was a nice char outside that really added a rich smoky flavour. Lastly, we had the BBQ Eggplant, which was the total opposite of the livers. 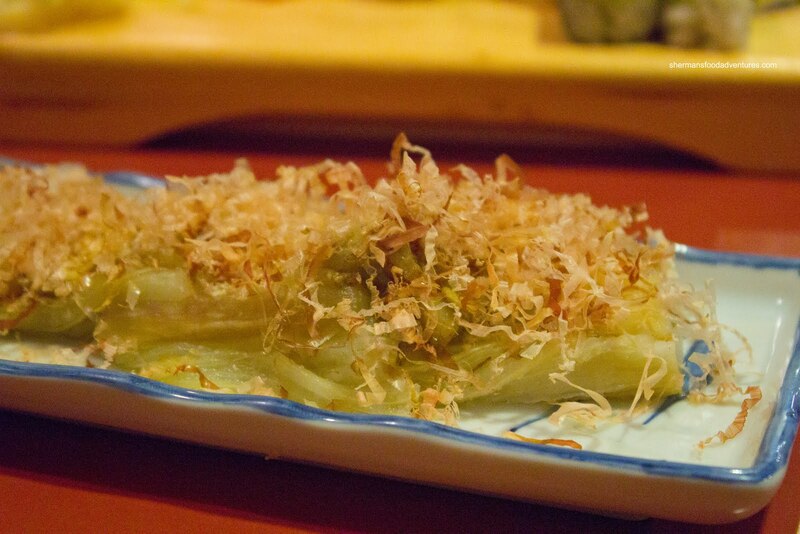 Topped with bonito flakes, the eggplant was soft and yes, "delicate". There wasn't much in the way of any distinguishing flavours other than the bonito flakes and really, that was their intention. I'm not sure why I keep ordering this type of eggplant because it is always a bit bland. So did authenticity count for this meal? I would say so. I mean the fish, rice and preparation was pretty spot on despite the hefty price tag. I suppose that I am not the only one who believes this since there are many autographed pictures and memorabilia of NHL hockey players adoring the walls. But for them, they have plenty of coin to spend on a place like this. For most people, it may not matter how authentic the food is since they may be looking for value instead. Therefore, I guess it comes down to whether people think it's worth it or not to pay the premium. oh my goodness i used to go here back in my high school / ubc days! so nostalgic! glad to see they haven't gone downhill! making me crave sushi at 8 in the morning now! !